In my latest #tiegrad class I was asked to think about, and reflect on, a misconception/misunderstanding about teaching and learning I have experienced, and how it has led to new insights and knowledge about my craft. The biggest misconception/misunderstanding I have experienced since I started teaching in 2006 is the realization that learning cannot take place before the social and emotional needs of my students are met first. I used to think my role as an educator was to teach content to students based on a set of guidelines provided by the Ministry of Education, and students would attend class each day ready and able to learn – but I’ve learned the hard way that this is not always the case. Before I realized the importance of attending to the social and emotional needs of my learners, I tended to open the academic floods gates at the morning bell and get straight to work. I didn’t know any better. I assumed that my students were ready, willing, and able to learn. I couldn’t have been more wrong! “Self-regulation is the ability to manage your own energy states, emotions, behaviours and attention, in ways that are socially acceptable and help achieve positive goals, such as maintaining good relationships, learning and maintaining wellbeing.” – Dr. Stuart Shankar. The ability of my learners to self-regulate is an important part of meeting the social and emotional needs of my learners. Making time to explicitly teach skills around self-regulation (making our learners aware of conditions they need to be successful, teaching them how to deal with unexpected situations, and how to relate to others) has become increasingly important in today’s classrooms. 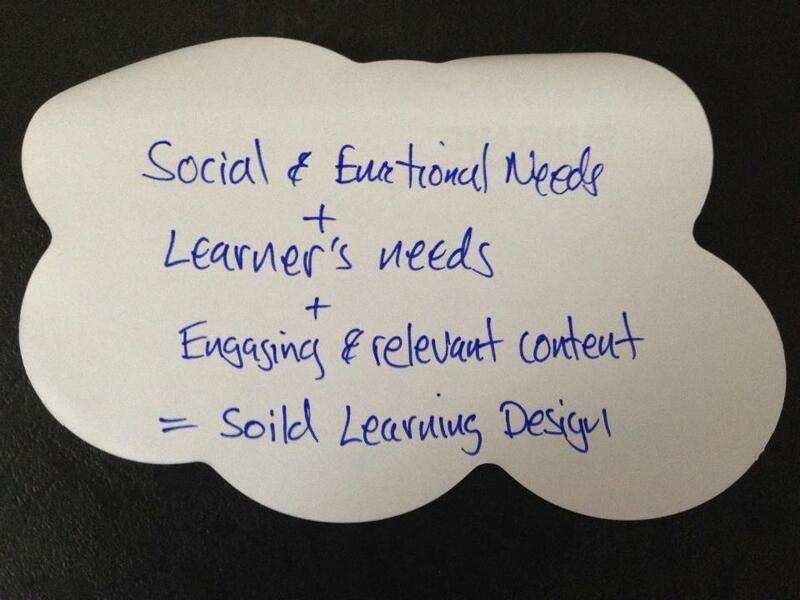 The best learning design in the world cannot reach the dysregulated learner. One can design experiences, which engage students fully in the learning process, ask questions that lead to meaningful exploration of the topic, and allow time for students to follow their own line of inquiry, but unless we are able to decode our learners and understand their state of mind as they enter our classrooms we are fighting a losing battle. By creating conditions where students feel safe to express their emotions and build community and support with their classmates, Restorative Classroom Practices can have positive effects on learner’s emotional needs. The simple act of gathering in a circle at the start of the school day, checking in with how we are feeling, creating a sense of equality, and giving a voice to every student, Restorative Classroom Practices have had positive and meaningful impact on the student’s classroom experience. Perhaps the biggest shift I have made over the years is that I have been able to shift decision making process from teacher to the students with remarkable success. Using the latest research in neuroscience, MindUp curriculum provides educators with the tools to engage their learners in how the brain functions, what the optimum conditions for learning are, when the brain develops roadblocks for learning, and techniques to overcome these roadblocks. Many of my learners struggle to attend to the ‘present’ while in the classroom. They’re either reflecting on the past, or looking forward to the future, and this lack of attending to the present is having negative effects on their school experience. Creating a ‘mindful’ classroom is not just a buzzword of 21st Century learning. It is precisely because of the speed and the attention grabbing technological world we live in that students need to create time and space to disconnect, focus within, and calm their minds. A mindful classroom creates a space for the dysregulated learner to find comfort and a sense of belonging. Here is an overview of Suzanne Bartel and Christopher Lister’s joint EDCI 338 Professional Learning Project about Restorative Practices including Self Regulation. Our original goal was to create an online place for educators who are interested in using Restorative Practices in their classrooms to connect and share experiences. Our plan was to take our existing Restorative Classroom Circles Wikispace and give it a facelift by adding the Restorative Practices philosophies, Compass of Shame, and the Social Discipline Window. We also planned to engage our current Wikispace members and attract new members from our Twitter networks and local school district colleagues. With our existing restorative methods, we wanted to include more social and emotional learning into our curriculum. We planned to introduce new concepts such as self-regulation (MindUP curriculum) into the Wikispace as a complementary addition to classroom circles. This morning, we read a tweet from Mardelle Sauerborn that said “Cool how the projects are secondary to the journey.” We couldn’t sum it up better ourselves! Throughout our journey on this project, we have been constantly growing and learning in our EDCI #338 class discussions, school district collaboration group, Restorative Practices workshop, and our personal experiences with Restorative Practices in our classrooms. After creating a polldaddy survey to elicit feedback from our Wikispace members and talking to colleagues already using Restorative Practices in their classrooms, we realized that we were not having much success using our Wikispace as a collaborative tool. We started to wonder if we were using the right platform to create a collaborative environment. In one of our EDCI 338 sharing classes, we were introduced to the idea of building a Google+ Community from Jane Rees and Allison Galloway. This platform meant that people could participate in our community without becoming a member. They could also add their own content and participate in online conversations. 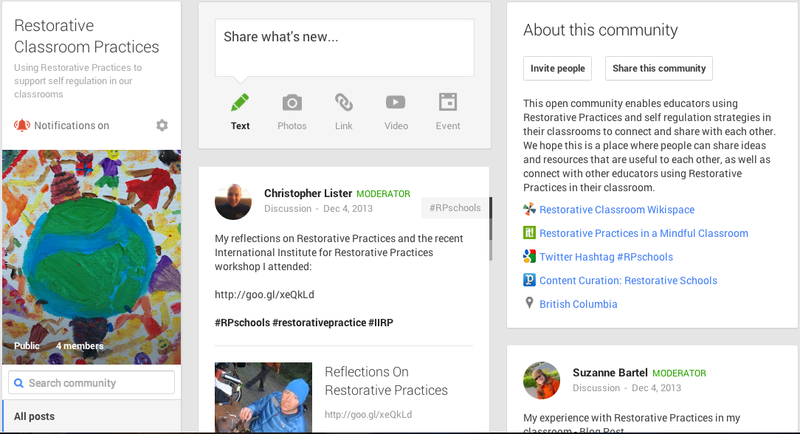 At this point, we decided that our Wikispace might be best left as a resource for implementing Restorative Practices, and a Google+ Community could be used to encourage collaboration. One interesting part of our learning journey occurred when we tried to deepen our understanding of Restorative Practices. Several Google searches for “restorative practices” returned little useful information outside of International Institute for Restorative Practices. We knew there was content out there but we had difficulty finding it. Our original plan was use Diigo has a tool to collect and share bookmarks on the topic. We attended a Hangout on Diigo hosted by Ed Tech Mentors Network and found that although it is a useful tool, it is limited in its ability to generate and evaluate content in the same that specific curation tools like Paper.li, Pearl Trees, and Scoop.it can. We really liked the magazine style layout and ease of use that Scoop.it offered.